[Registration Closed] Health Policy Academy the 8th Session - Health and Global Policy Institue（HGPI） The global health policy think tank. We closed the application on February 24. Notification of application will be sent in 8th March. We sincerely appreciate your cooperation. 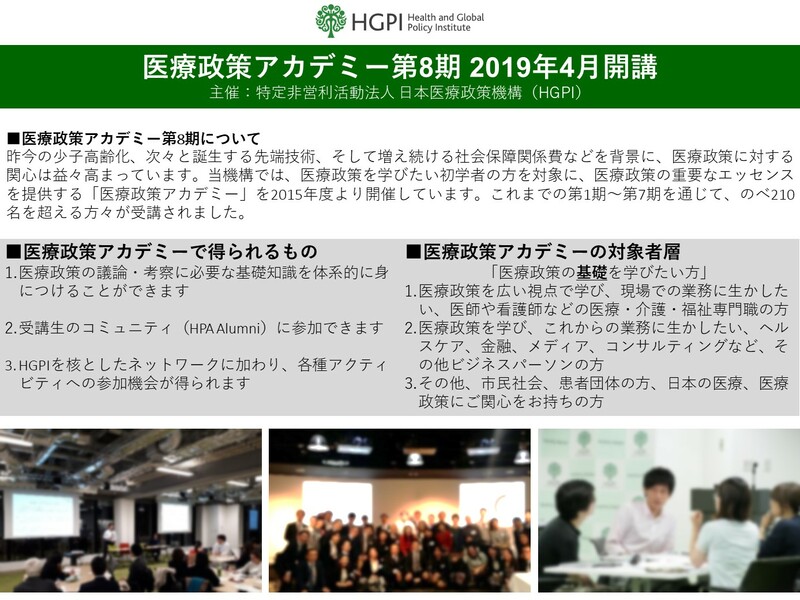 In the face of changing population demographics, constant health technology advances, and rising health care costs, health policy in Japan is now more interesting than ever. The Health and Global Policy Institute will offer a program entitled Health Policy 101, for people who would like to gain basic knowledge of the Health Policy. In this program, participants will be able to learn the essentials of the health policy. For more please visit the Japanese website.